Tenola Triathlon Wear is proud to announce that Team GB triathlete Katie Ball has agreed to be our latest Brand Ambassador. Lincolnshire based Katie, 26, trains with the Boston Tri Club and currently represents Team GB in the 25-29 age bracket. Katie’s foray into the world of fitness began just four years ago when she was looking for a new hobby. With little aptitude or interest in sports - she was in fact barely able to swim when she first started training, she became hooked on the challenge of mastering a multi-disciplinary sport. Grit and determination saw her quickly progress from complete novice to talented triathlete. Having been bitten by the triathlon bug, Katie has had to work extra hard to bring her ability up to the level it is today. Her tenacity and dedication see her training for around 11 hours a week alongside a full time job, demonstrating her commitment to this demanding endurance sport and her determination to succeed. Keen to inspire other novice triathletes just starting out just how much can be achieved in a relatively short period of time, Katie is also an excellent role model for getting more women into the sport and a perfect candidate to represent the rapidly growing Tenola brand. As brand ambassador, Katie has the full range of women’s tri-kit which she uses it on a regular basis. Katie tells us that the women’s Tri-suit as her favourite piece of kit from the range due to ‘the great fit’, and ‘the speed at which it dries when you get out of the water so you don’t get cold’. Tenola has designed tri-wear to be both flattering and technical, and feedback from Katie will help shape future designs. Katie also reveals that she is impressed with the attention to detail Tenola clothing offers, such as the handy pockets down the sides which she has found to be perfect for putting energy gels in. Tenola are thrilled to receive such glowing praise from a semi-professional tri-athlete on our range of tri-apparel created by experienced UK based sportswear designers and tested by seasoned tri-athletes. Check out the short Q&A with Katie on the Tenola website as she prepares for a gruelling summer of training in preparation for representing GB in August at the Sprint Distance Triathlon in Glasgow – having already beaten 60 other competitors to secure one of only 20 places, Katie knows all her hard work is paying off as her rankings continue to rise. And whilst many will be heading off to Ibiza later this year for sun, sea and late night clubbing, Katie will be flying the flag for Team GB and Tenola in the Middle Distance Triathlon European Championships. We wish her the best of British luck! And last but definitely not least, we are also pleased to announce that we will be working in partnership with Lomo wetsuits to complete our offering as a ‘one stop shop’ for all your triathlon apparel needs, offering the complete package for novices through to professional triathletes. In keeping with our Made in Britain ethos, Lomo are a Glasgow based company who pride themselves on providing high performance products at a low cost, demonstrated by their wetsuits currently retailing at below £100 the mark. 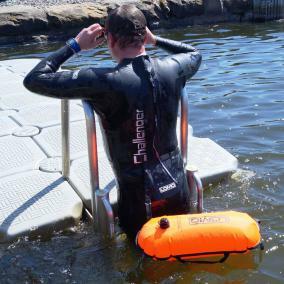 But don’t just take our word for it; 220 Triathlon Magazine gave them an impressive 81% and feedback we have received so far has been very positive, so keep an eye on the website for the new Lomo products.